Dining Room Makeover… another one! Remember when I moved into my house in NY, I did my dining room like this…? I liked it. It worked for us. Fast forward 8 months and the black table and chair set was not working for me… It did the job just fine but looked too dark and overwhelming in the space with the 4 chairs and the black made it look really heavy in the room. Not too mention, I never put vinyl on my burlap chairs and my kids did a number on them. Burlap, food, and kids dont mix! PS. Its a 35″ square table and it took up most of the space being in the center. I was over it! I browsed Craigslist for a month or so… really often… I didn’t find anything. I toyed with the idea of building a farm table. I wanted a farm table but I needed a very specific size. It was a tall order for the mediocre Buffalo Craigslist classifieds to fill. Then… I FOUND IT! 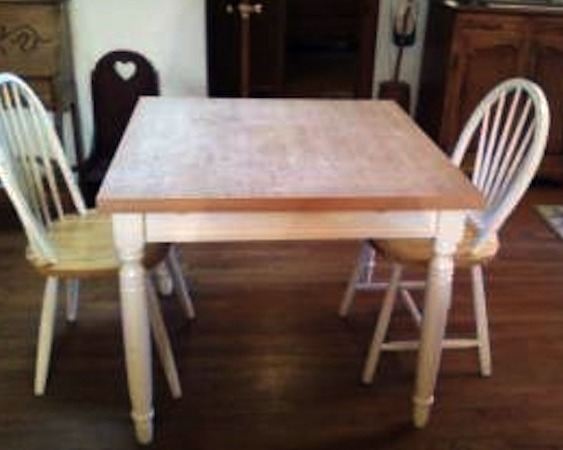 I found a square white farm table with a wood top and two chairs for $50! YAY!!!! I called the lady and she said she still had it and I could come see it. THEN she warned me. The top was formica and not in the best shape but the table and chairs were sturdy and in good shape. I wanted the base of the table and was willing to pay her price for the perfectly sized farm table base I’d been searching for. I could construct a new table top right?? I drove my little SUV through the ghetto to her cute neighborhood. Her neighborhood was fine but the area between her little town and mine was scaaaaaary to say the least. HA! I talked her down to $40 due to the condition of the formica table top. 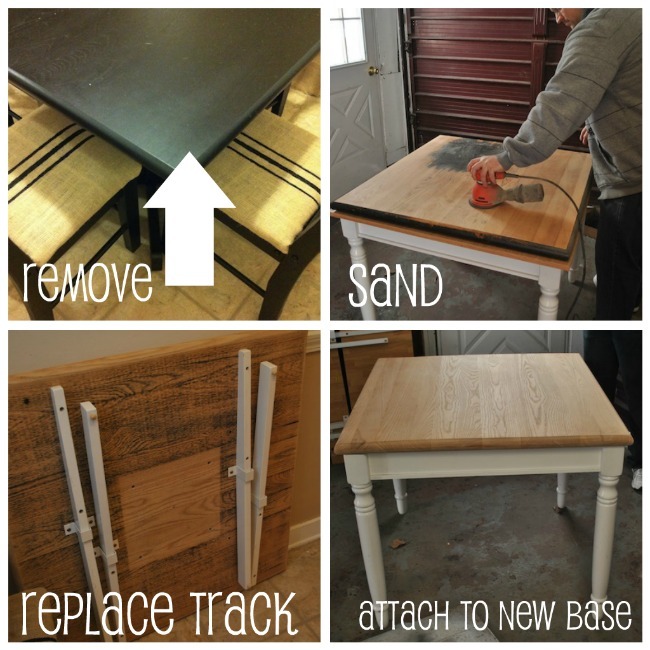 I had the brilliant idea of swapping out the formica top for my black table top since THEY WERE THE SAME SIZE! Meant to be people, meant to be!!!! BIG thanks to my adorable hubby for going in our garage (where it was 20-something degrees) and doing all the detaching, sanding, reattaching etc. I bought a little tiny can of this magical stuff…. I bought the teeny tiny 8oz can and only used half of it! So remember if you have a smaller staining project, save yourself the money, this stuff goes a long way and you save money by not having to buy Polyurethane! Learn how to stain wood here. I bought it from wal-mart and bought the “gloss” not satin as pictured. It didn’t go on quite as dark but I love the shade I ended up with. If I would’ve done a few more coats, I could’ve gotten a darker shade but I was happy after 2 coats. I found a few wooden chairs for $3 each and got to work on them. 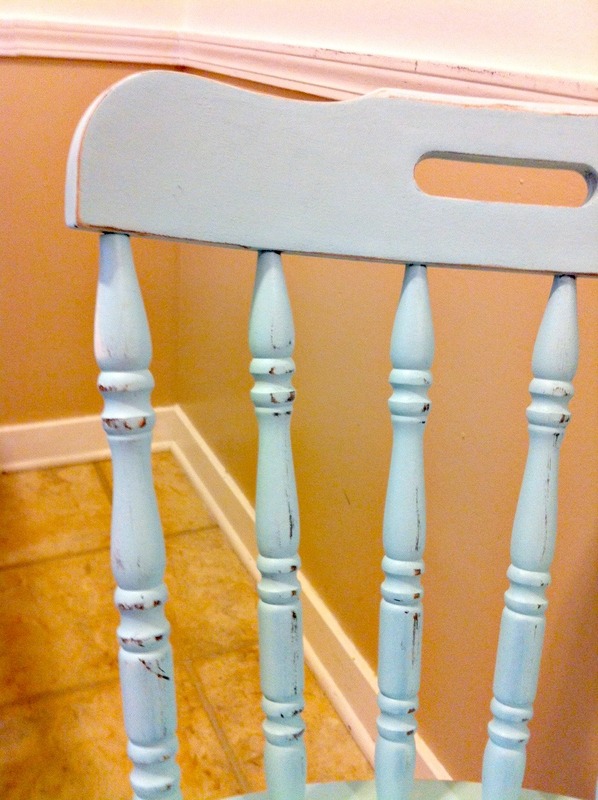 I painted the chairs the same color as my craft room dresser since I had the paint lying around and I LOVE the color. 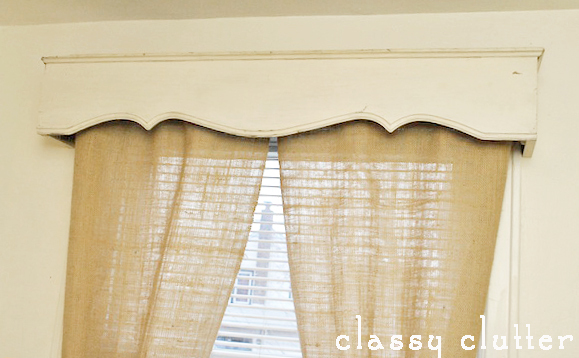 I updated my curtains by removing the top ruffle and adding a $1 wooden valance that I scored from ReStore. I actually bought it cuz I loved it and had no idea where it was going then about 3-4 months later I figured out that it fit PERFECTLY here! I love that store! I used the removed ruffle fabric and made these cute little bow tie backs. Eeeek! I love bows! With a little rearranging, I absolutely love my dining space now! Here’s the move-in photo, progress and AFTER! I love progression photos! and one last time for fun! Ahh! It makes me so happy to see it finished! Next, I’ll show you the rest of the kitchen. I just refinished the cabinets and I’m in LOOOOVE!!! Super cute! Great idea, too!! What a great switch. I also really like your curtains. Cute. I love the clock and the neutral colors bring out so much class! 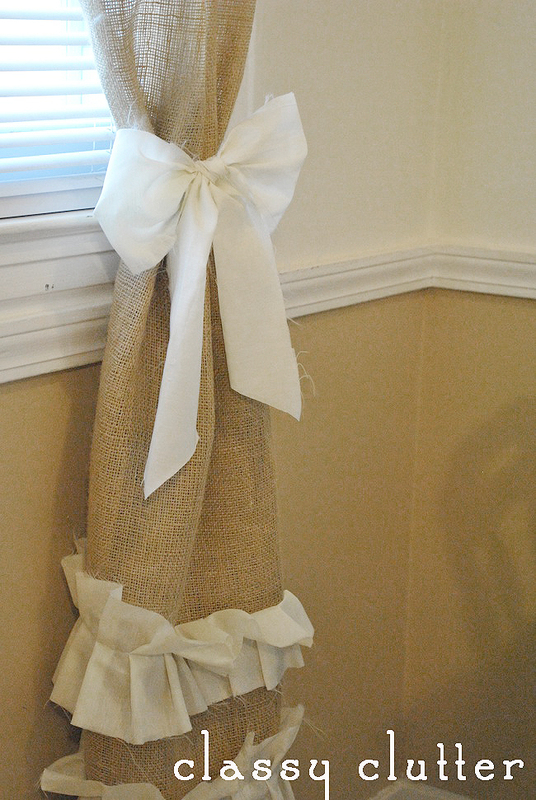 and the burlap is so fun! Great job! I would love for you to stop by the Naturally-Nifty Linky Party & Link this up! Such a transformation…your space looks twice as big. 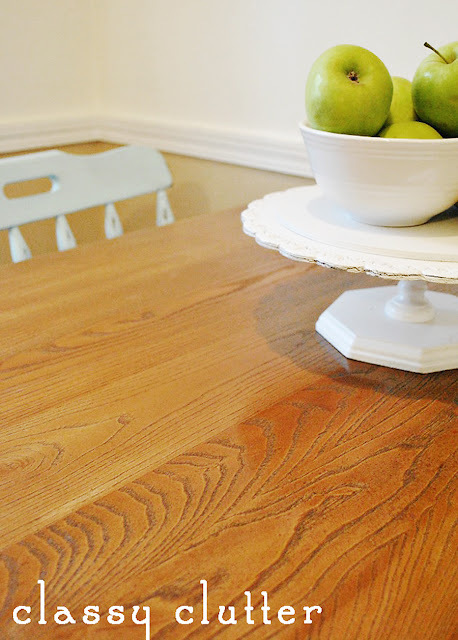 The new table is fantastic and I LOVE that wooden cornice! The new look of the curtains is just SO GOOD!! Wow- you really did score on Craigslist!! You’ve been busy with these makeovers but it has been well worth it! 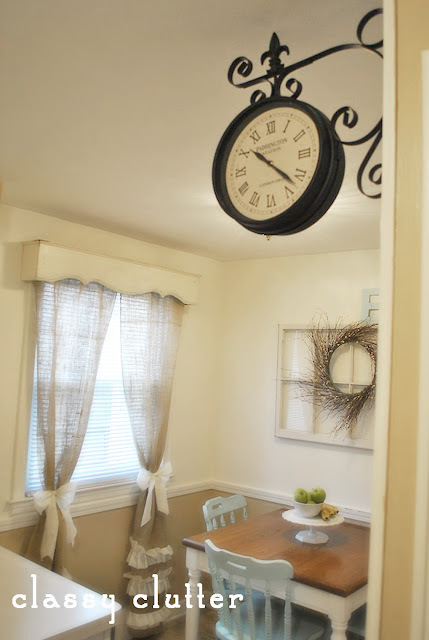 Love the ruffles on the curtains and the black wall clock, too! How cute! Those bows on the curtains are incredible! AH-MAZ-ING!!!! Looks so good Mallory! I love it!! Aw, I love that space. Good job. Awesome! Love the aqua chairs 🙂 and the curtains are adorable too! So cute! I love your table and the color of your chairs! You did a great job! Beautiful! You found a great table and chairs for $40.You made it look fabulous with the wood top! love it! Stopping by from Under The Table and Dreaming. Lucky you to find a table base and 2 chairs for such a good price. 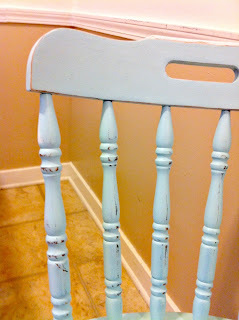 I love the white and light blue and agree it really makes it all seem lighter and brighter. 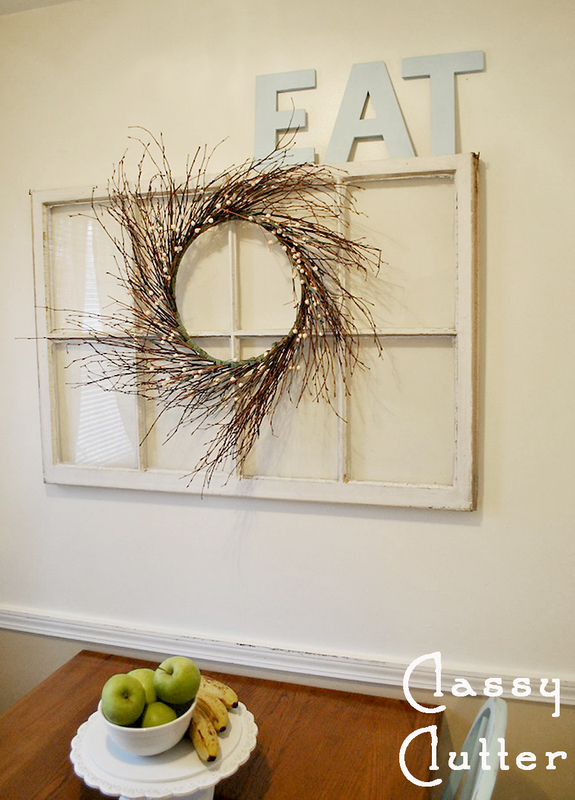 The wispy wreath is a great addition. 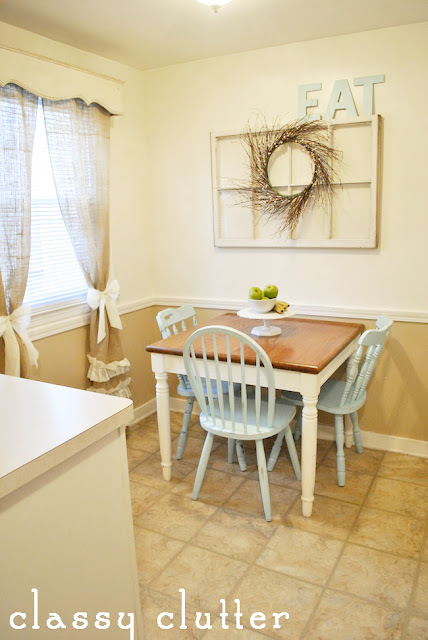 Great job on the table and with the painted chairs, just adorable! Your kitchen is just darling. 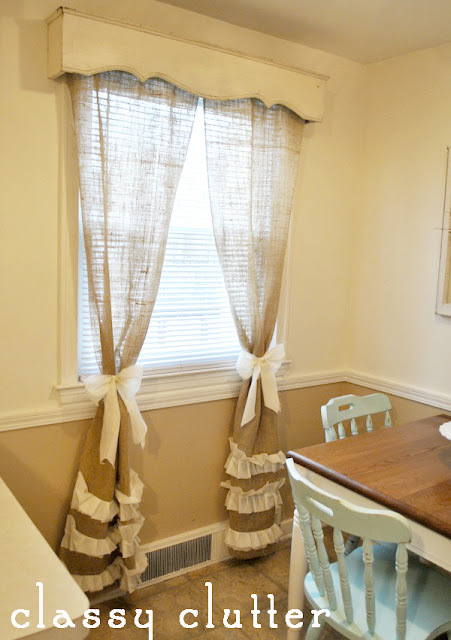 I love the curtains, and the color of the chairs is fab. Super cute! 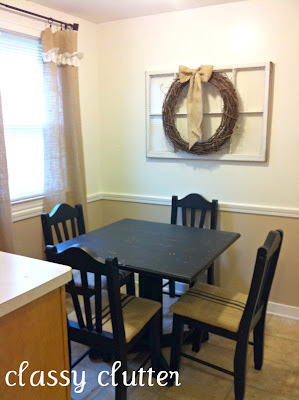 I painted my dining set black about a year ago and want to do something similar now – I’m over the black! Thanks for the inspiration! I love it! The epitome of the shabby chic style (which I totally adore!). Beautiful job!! It looks beautiful. Quick question though. If you are a family of four – where is the fourth chair? Haha, thought the exact same thing! The new set does lighten things up considerabky and I super love the valance! I had no idea what ReStore was until I read your post, we have one here in Houston and I’m in love! So sorry, This is adorable, but I thought that your sign said “Fat” instead of “Eat” at first….I was like, well, that could get me to think twice on what I am putting in my mouth! HA! I must know the paint color of those chairs! I love that color!